From the kitchen of One Perfect Bite...lShe appeared on the scene at a time when celebrity chefs still wore button-down "dress" whites and their cookbooks, for the most part, were formulaic "knit one, purl two" instruction manuals. This photogenic daughter of the British peerage seemingly burst out of nowhere, and, with her famous come-hither grin, convinced us that a lusty appreciation of good food was an acceptable extension of the good life. I speak, of course, of the domestic goddess, Nigella Lawson, who is being featured this week on our on-going series of women on the Gourmet Live list of 50 Women Game Changers in Food. She is a wife, mother, writer and media personality who happens to come from a distinguished and privileged background. Her father was Chancellor of the Exchequer in Margaret Thatcher's government and her mother, a great beauty, was an heiress with an impeccable background. She attended Oxford where she received a Master's degree in Medieval and Modern Languages and she went on to become the deputy editor of The Sunday Times. Her love of food led to some cross-over in her writing, and she began to write a food-column for The Spectator magazine. She married John Diamond, a broadcaster and fellow journalist while writing for the magazine, and he was instrumental in transforming her appearance and developing her public persona. Her first book, 'How to Eat: The Pleasures and Principles of Good Food', was published in 1998 and it was the springboard to her television series 'Nigella Bites.' The show was a huge success and it led to a second book and another series. In 2000, she published her 3rd book, 'How To Be A Domestic Goddess', which was voted Cookery Book of the Year' by the Guild of Food Writers the following year. While it was a period of professional success, she lost her mother, sister and husband to cancer during this time. She took a brief rest and then went on to write 'Forever Summer', 'Feast: Food that Celebrates' and 'Nigella Express'. Her books have sold over 3 million copies and she has continued to appear on television, here, and in Britain. My favorite Nigella story regards an appearance she made with the heiress Gloria Vanderbilt on an Anderson Cooper show years ago. Vanderbilt is Cooper's mother and I think it is fair to say she did not do a lot of cooking when he was a child. At any rate, she and Nigella were friends and they agreed to appear on the program to do a dry run of the Thanksgiving meal Gloria planned to make for her son. Nigella walked and talked her through stuffing and roasting a turkey and things went swimmingly, save for the fact that Anderson Cooper was so stunned to see his mother in an apron, that he had a fit of giggles he could not control. His mom just beamed. It was a gotcha smile if ever there was one. I wonder if he got the wish bone that year? While the food that Nigella Lawson prepares is very approachable, I have yet to come across a recipe that represents a culinary breakthrough. Her food is seductive and nicely done but her books are not places you will find innovation or new techniques. Her recipes are interpretations of food she has eaten and enjoyed and I am fine with that. With that in mind, I wanted to chose a recipe that I had had elsewhere and compare her version to it. I chose Liptauer cheese, a personal favorite of mind. There are many recipes for this wonderful cheese spread and while I really liked Nigella's version on bagels, I prefer my old stand-by for snacks and appetizers. There are no pitfalls in the recipe below. I hope you will give it a try. Here's Nigella's guide to making Liptauer cheese. Beat the two cheeses together until they are smooth, and then add all the other ingredients. Mix everything together well, and then turn into a small bowl with a capacity of approximately 1 quart, lined with plastic wrap for easier unmolding later. Smooth the top with a spatula and cover with the overhanging plastic wrap. Place it in the refrigerator to set. I put a couple of cans on top to press it down, but I don't feel it's crucial. I think it's because my mother was always putting pâté and suchlike in the refrigerator with weights on. When it has become cold enough to turn out — a few hours should do it — unwrap the folded-over plastic wrap on top, place a plate over the now uncovered bowl, turn it the other way out and unmold. Pull the plastic wrap off and drizzle over a rust-red ooze, made by mixing the oil with a pinch of paprika. Serve this with bread or poppy-seed-sprinkled bagels, gherkins, and, if you like, some chopped red onions. The following bloggers are also featuring the recipes of Nigella Lawson today. I hope you'll pay them all a visit. They are great cooks who have wonderful blogs. Next week we will highlight the career and recipes of Diana Kennedy. It will be really interesting to see what everyone comes up with. If you'd like to join us please email me for additional information no later than Monday, April 23rd. I have seen her on T.V. a few times, what an awful life she has had, regardless of whether she is famous or not. Anderson has been getting the giggles more and more often lately! I love Liptauer cheese, it's our traditional cheese in Trieste! I haven't had liptauer in years! I agree with you about the non-groundbreaking-ness of her recipes. They are lovely, they work, but there is seldom anything truly new. Except her coq au riesling - which was definitely new to me and is absolutely divine and so quick! I learned a lot in this post! I never knew much about Nigella except she was some sort of famous foodie person (how sad to lose three people to cancer so close together!! ), I had no idea Gloria Vanderbilt was Anderson Cooper's mom, and I'd never heard of liptauer cheese. It sounds like a wonderful spread. This is yum, I used to make something similar but then i was just eating too much of it with crackers at any time of the day and I had to stop :-)! her usp is that she talks and makes home food in way that non-cooking people can cook them easily too...and i like that..recently made cupcakes following a recipe of hers ..it turned out great!!! I love her show and she's such a dream to look at! This looks like a great appetizer recipe for a crowd! Never tried the liptauer cheese, but according to Nigella "you didn't leave till the day you try it..."so, I suppose I need to start living :)). I love Nigella recipes exactly because of what you said: no complicated techniques, very approachable recipes and, what I like most in her recipes is that you get exactly what you see on the picture which for me is great and I know what I'm saying because I'm a bit of a cookery book/testing recipes nerd :)). I enjoyed your write up and stories of Nigella Mary. This spreadable cheese has to become one of our favourites too. ha! really love Nigella and her style she enjoy at kitchen and love it:) this look awesome! I agree with your assessment of her recipes - but I must say I enjoy how easy they seem to be. The cheese is a fitting example - very tasty and but together without a host of problems. Sometimes that is just what I want! I so love Nigella. And every recipe I have tried of hers has been a hit. This one looks lovely!! I love the idea of mini molds of this cheese served on a Sunday brunch table ... cut and elegant. I love Nigella but have to chuckle at her 'persona' ...you're right, though, her recipes are tried and true dishes that stand the test of time and are not intimidating to the 'harried cook' or busy career person who comes in from a hard day and wants a good knosh. Mary, Such an interesting post. Love the Liptauer cheese…looks and sounds delicious! Have a great weekend! I have never tasted liptauer cheese, however, it does sound delicious. This is a very informative post that I have so enjoyed. Hope your weekend is full of great things. i have been in gloria's kitchen. i'm not sure that she has. can understand anderson's reaction. I've never tried Liptauer Cheese before, but it sounds like a nice appetizer for company. I agree, Nigella's recipes are not anything groundbreaking, but I think that's what makes her so popular - they're just easy and approachable. I always enjoy this feature. I've never really followed Nigella, so I haven't tried any of her recipes and I certainly didn't know her history. How sad to have lost three loved ones in a row like that. My impressions about Nigella's food were pretty much the same as yours. I don't think it's anything special or different. But, she is a beautiful woman and she seduces her audience. MMmmm so this is how you make Liptauer cheese. Must do this! Great recipe and Nigella is my fav! I have never heard of this type of cheese before but it looks wonderful. Have a great weekend Mary! What wonderful cheese you picked. I really like Nigellas recipes. She uses very interesting ingredients. Things I wouldnt think to put together. I am glad you shared this recipe with us. Love Nigella's recipes,cheese looks marvellous..
Mary I just loved your write up and I had not come across that story before. It is funny and charming! I agree with you that Nigella's recipes are less than innovative and I actually found that I would make several changes in the one I made. That said, your cheese looks wonderful. Hope your hubby is as well. I've never even heard of liptauer cheese. I must have been hiding under a rock. I'll have to give it a try. You found such a cute photo of Nigella! I'm still smiling. And you chose such an unusual recipe too. Your cheese looks delicious. Happy Weekend, Mary. Oh boy, your cheese mixed sounds incredibly delicious. That's a lovely write-up on Nigella, Mary! 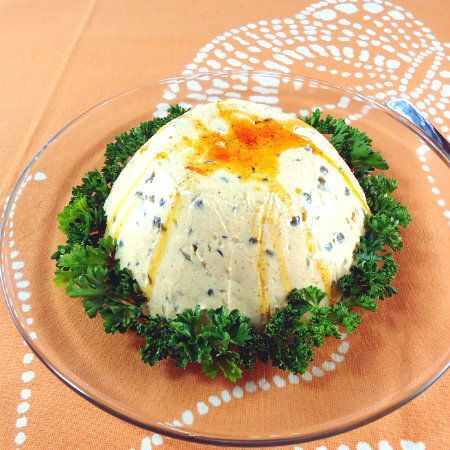 You picked a great recipe and I love the spices and flavors that went into this cheese. Yummy! What a fun, informative post. I'm a huge Nigella fan, for exactly the reasons you outline - delicious comfort food presented in a fun, non threatening way! I've never had Liptauer Cheese, but plan on trying it soon. I had this book when it came out in England and loved making this recipe. However, just because you come from a phenomenally rich family don't equal being a daughter of a "peer".